As a team we were well glad to see the back off 2017, it was the hardest year weather wise that any of us had been involved in during our time as greenkeepers. The actual amount of rain that fell during the year was 850 mm, the third driest year in the last 10! !, the problem we faced was during the whole 365 days there was only 140 of them that were dry. The problem was that out of 225 wet days over 50% was 2 mm or less of rain, therefore just topping up the ground every time. I’d rather have an annual total of 1100 mm with 200 dry days, that would be a lot easier to work with!. It’s been very difficult at times for us to get machines out on the course so we have spent time thinning out plantations on the course. 1, We took out trees that were weak, other tree’s were stunting their growth. Only the strong survive. 2, We removed the dead trees. 3, Most importantly for us, we removed any trees that didn’t fall into the category’s above to make it easier and quicker to cut rough. Due to the placement of some trees it was impossible to get close leaving large areas needing cut with another machine. It does annoy the greens team when we get comments about cutting trees down ‘again’. Over the past 17 years we have planted probably in the region of 20-30 times more trees than we have took down. We must remember that being a golf course must be priority number 1. Below are photo’s from 2000,2003 and last year. I think they back up my claim. Since we have returned from the christmas break we have begun work on turning the two large bunkers on 18th into 4 smaller bunkers. We took 15 house bricks out of the one on the left during re-shaping!! We also found in that bunker that the drainage pipe was 6″ higher in the middle than at the start, water doesn’t run up hill!!! We also discussed the short game area on the practice ground. The plan is to finish of the ditch, this has changed from an open ditch. we will now replace the 6″ pipe with a new twin walled 12″ pipe, this will take 4 times the volume of the old pipe. We will also lower the height of the ditch that runs along the 1st fairway. The chipping area will be drained with land drains then sand slitting will be done on the surface. We will also be constructing some chipping greens and installing some mats to play from. I will be doing a blog closer to renovation time to go through the detail of exactly what will happen in March. I have got concerns regarding the fronts of some greens. We will be targeting small areas where we will be hollow coring with jumbo tines and running over some areas with the Graden. Just a polite reminder to all the members of the importance of repairing pitch marks. Having hand cut the greens this morning I was shocked/ annoyed/ disgusted with how many un-repaired pitchmarks there are, to make it worse i saw as I was cutting the 14th green two groups, a two ball & 3 ball both leave 1 pitchmark per group un -repaired, these are members who play most days. Due to the run of weather we have had the greens are softer than we would like so any shot coming in is likely to make some kind of mark. So if you hit the green you will have some repair to do. Please self police this. We are aware that one area of the course that is in dire need of attention/ repair are the paths. We are currently in the process of adding extensions to the paths on the 1st, 17th & 18th. 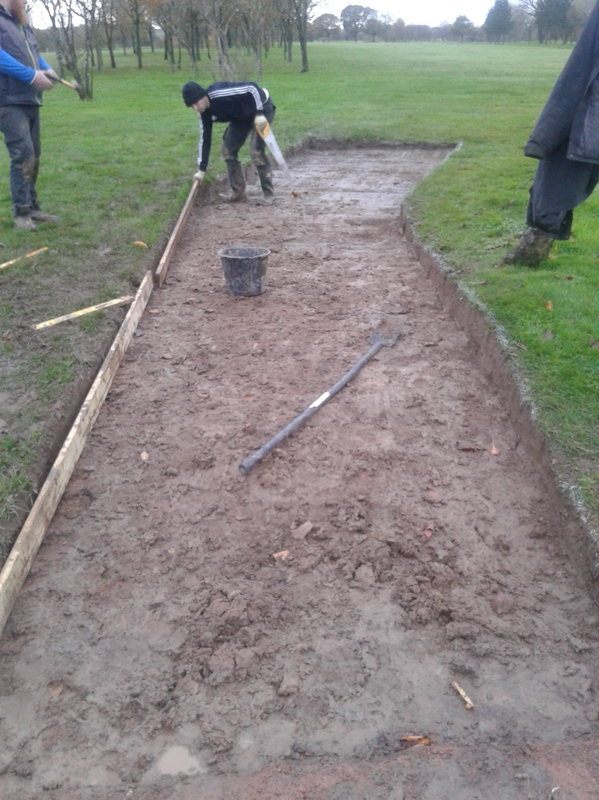 We are also constructing a new path way that will go from the rear of the 1st green up to the path on the 2nd. We are preparing these areas for the 20th November when a groundwork team will come in and ‘dress’ these paths. Dressing is similar to what happens to the roads on a 4-5 year plan. A thin layer of bitumen 15-20mm will be applied with 10mm stone layered and consolidated into that surface. This will give up level and safe paths that can be used all year. We have a plan to do all the paths on the course in this fashion. We are doing the ones around the club house 1st (1st&17th before xmas) 2nd & 18th just after new year. We have chosen these purely because of the little impact on the course doing these will cause. If we are happy with the results the others will be done in stages. Into drainage, We have had a dug on the 6th and installed a new latteral as discussed in previous blogs. On the 13th we have dug and inspection hole, unfortunately there is limited fall between that area and the outlet on the right-hand side. The plan is to dig a large soak away and backfill with stone/ rootzone. As you can see in the pictures above we have aerated the area intensely (look close you can see the time holes) , unfortunately if there is no outlet for the water to go to it will just sit there accumulating. The next phase of drainage to the greens are planned for the front of the 2nd & 14th. These will start once the level of cutting on the course has died down. We are still on with aeration of the greena to help with removing water and keeping the rootzone healthy. This will be alternate between slit timing and using the pro core. We had a meeting to discuss what are plans and aims are for this winter. Obviously the main topic was drainage as this is our most pressing problem, path work, bunker work and tree work was also included in the plan. Graham is currently in the middle of producing a the end plan, I will briefly go through the main issues in this blog. After shelving the drainage projects on the 2nd & practice ground due to the ground being too saturated it was decided that are major focus would be on the areas of greens that have become soft after all the rain we had in Aug, Sept & early Oct. The areas concerning me are the front of 2nd, front of 6th, back of 13th & the front of 14th. 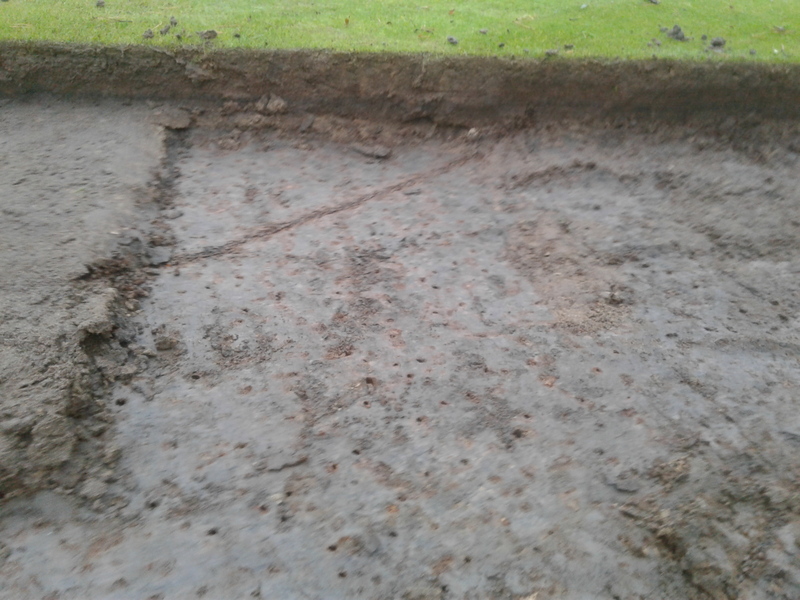 The plan is to dig on the problematic areas on these greens and install new drains if needed. As you can see from the photos above we have started work this week on the 6th. We have dug a small new drain onto the green that will run into an old drain that goes into the old ditch behind the net. Please note that this drain has nothing to do with the drains installed last winter. This is an older system that last had work done to it October 2012. I had discussions with a member on Monday regarding why there is no water running into the ditch from the 6 drains that run into it. Information has never been passed on but all the drains have been cut through by the new system, the only reason we piped them up is because we felt it would be beneficial that IF any water found its way down the pipe it would be able to be taken off the course. The drains you can see are all about 10 feet in length before the new system cuts through them. The new outlet is in front of the 7th tee, if you was to have a look you would see that today, the pipe was running around 1/5 of the 3″ pipe. If you were to look after rainfall you would see the pipe 1/2 full. Personally i’m quite happy with the 6th after the drainage work, after all the rain we have had during the past 10 weeks the area would have defiantly been shut for quite a few days if no work had been done. The only area that concerns is at the very end of the ditch where everyone goes to and from the green, we may have to do additional work in this area. Today we managed to verti drain all problem areas, the ground conditions are not ideal, but the best they have been for a long time. Thursday morning we will run the shallow slitter over the greens followed by the greens iron. The other area of the course that needs intensive work are the pathways, we are currently looking into every path material available to see what will work best for us. We have agreed that all paths on a slope must be done with a solid material to stop aggregate running into drains. the cost for doing all of the paths and extensions in some areas is massive, so this work will be done over time. Initially the paths on the 1st and 17th are being considered to be done. Every year we go through all the trees and remove any that are dead, damaged or diseased. This year our plan is slightly different, we will be taking out trees that also slow down the cutting of the rough. we will also be removing lower branches that can cause injury to the rough operator. We will be replacing the trees we take out in new locations. Over the last 20 years we have planted hundreds and hundreds of trees to improve the course. Bunkers are still a hot topic, we haven’t finalised a complete plan for the work. The fairway bunker under the oak tree on 17th will be filled in, this bunker is full of tree roots and debris. we are also planning on splitting the 2 bigger bunkers on the 18th, making 4 smaller bunkers. Thankfully this week has been drier, we are able to get the majority of the course cut. There is sign of disease on the greens so we sprayed a fungicide today (Wed) to help combat it. Thanks for reading, please follow us on twitter @ashtonleagreens, this will give you daily reports on the state of the course and updates of what we are doing.We also have a facebook page, search for Ashton and Lea greens. Please like the page and ask your golfing friends to like the page, make them aware of the good things we are doing and producing. Just a quick blog to make you all aware that the two drainage projects we had planned for Monday 2nd of October have had to be postponed. We have had 20mm of rain this month already. Dixon drainage were booked in to start drainage work on the 2nd (400m) and the chipping area of the practice ground, this enabling us to start phase two of that area by installing some chipping greens. The 2nd hole drainage will now probably have to wait until next spring as the ground around there will take an age to dry due to recent weather we have been having. The chipping area will be assessed every week, with regular communication with Ryan Dixon, we don’t want to go on the area when the ground is too wet as this would do more damage than good. We need a dry week or 2 to stand any chance of this project being done!! 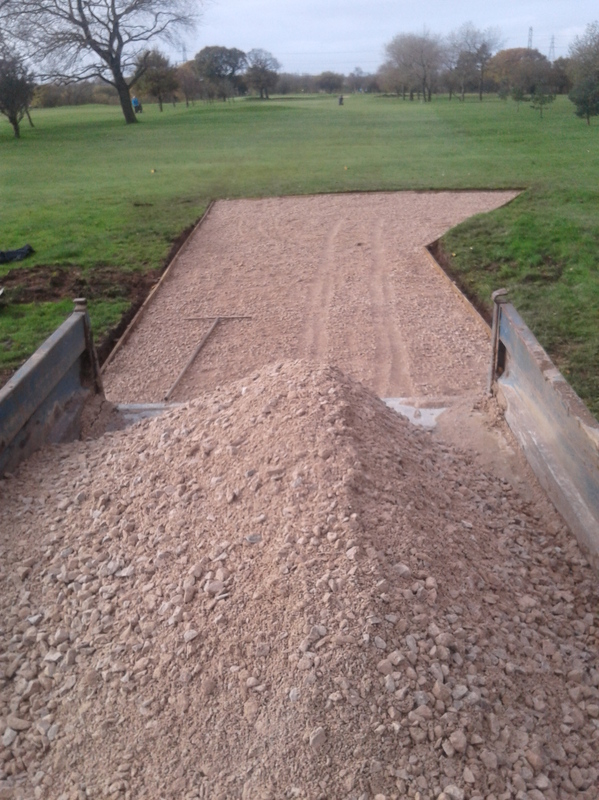 We need to install the drainage 1st, then this will allow us access onto the area to start building the chipping greens. There are plans to have 3 greens that you will be able to chip to. We are using the spoil we acquired from PNE to build the bases. As you can see in the picture above we’ve had a terrible run last month, with only 5 dry days, this has knocked us back in every aspect of greenkeeping. Thankfully we got another 10T of top dressing on to top up the levels, only the 7th & 17th need a little more. Due to the rain we haven’t been able to fully cut the course all month, there are pockets of rough and semi that are just far too wet to go on. The greens have recovered well after the renovations, with the feed that we applied doing a great job. It’s always difficult after we do such aggressive work to the most important area of the course, this is why we appreciate your patience when we do so. There will be a divotting party lead by the Captain on Monday 9th October at 3pm. If you are available please come and help. We began our renovations on the 4th of September with the hope of boxing it off in one day. We had hired in a core collector and power brush to make the task easier. Unfortunately for us the core collector wasn’t the greatest so we had to collect the cores all up by hand, which is very time consuming. Day 1 we had 10 greens cored, dressed and brushed in. As you will see later on in the blog through a weather graph the Tues (5th) was a complete wash out , nearly 19mm fell, which in one respect was great to wash in the dressing but on the other hand made everything else a complete nightmare. So we went into the Wednesday with 9 greens to complete. Wet greens with wet sand was not going to be fun. We were having good success until the tines we had bought wore out with 3 greens to go, this is not normally an issue if you use them on drier greens, but due to them being sodden it wouldn’t pull a complete core out. The pic shows how the bottom of the tines have worn out. This meant we had to solid tine (12mm) greens 9,16 & 18 and the putting green. All in all during these 3 day we got all the greens done and topdressed. We applied approximately 25, the target was 30 but due to the sand being so wet it was impossible. We overseeded on the Thurs with 30kg of bent grass seed. Since we finished on the Thursday the weather really turned against us, making it impossible to carry out any remedial work that needed doing. The greens were only cut twice during this week because it was too wet, we couldn’t get on with the roller and more importantly we couldn’t get on with the feed because of the wind. None of the greens that needed topping up could get finished either, to be honest it was very very frustrating for the greens staff. The last of the heavy rain fell last Thurs (14th), 5mm from midnight – 5am. Thankfully after that storm had passed weather conditions became calm, we fed the greens that morning. Granular feed ideally gets watered in, as you can tell from the graph, since we applied the feed, rainfall has been minimal!!!! The pictures above show the before and after effect of applying the feed. These photos were taken 4 days apart, there is still a lot more feed to break down and become available to the plant so every day the recovery will get greater. Due to the weather we experienced during this work I would say we are around 5-7 days behind where we would like to be, unfortunately it was completely out of our hands. We managed to get another 5T of sand on Tues 19th, this has helped top up the majority of the un-filled holes. For the next 10-14 days we will let nature take over in the recovery. After this period we will apply small amounts of dressing every 2 weeks whilst the grass is still growing. We have been advised by the STRI to stop tine aeration until the end of October, this is to try to limit the amount of eggs the crane fly can lay into our greens. Because of this we have rejuvenated our very very old slit tiner, this will be used early October to allow gaseous exchange and water infiltration. There will be a divotting party lead by the Captain on 2nd October at 3pm. If you are available please come and help. Just a quick note to let you know what is happening next week on the greens. This year we are moving away from the Graden work after verti draining, instead we will be using 10mm hollow tines. This will be followed by top dressing and brushing in using a sweep ‘n’ fill brush. We are not using the Graden this year after 4 years of using it during September work. There are two reasons for this. We are happy with the organic matter levels in the greens so feel this aggressive technique can be relaxed for a year. 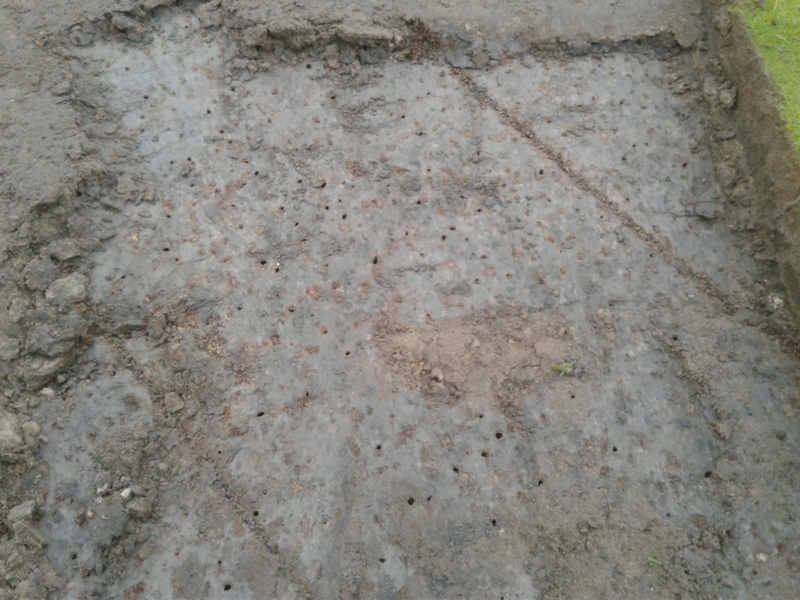 We have struggled all year with shallow rooting due to leather jacket damage, 10mm hollow tine will give the roots greater chance to establish. We are planning to use the Graden machine next September, probably using it on a biennial basis. We are planning on getting around 35-40 tonnes of sand into the profile by using the hollow tines. Work will commence on Monday 4th Sept, and hopefully finish Tuesday 5th. All weather dependent. On the Tuesday we will be over seeding the greens followed by another light dressing. There will be disruption all day long on these two days with temporary greens being used where needed.